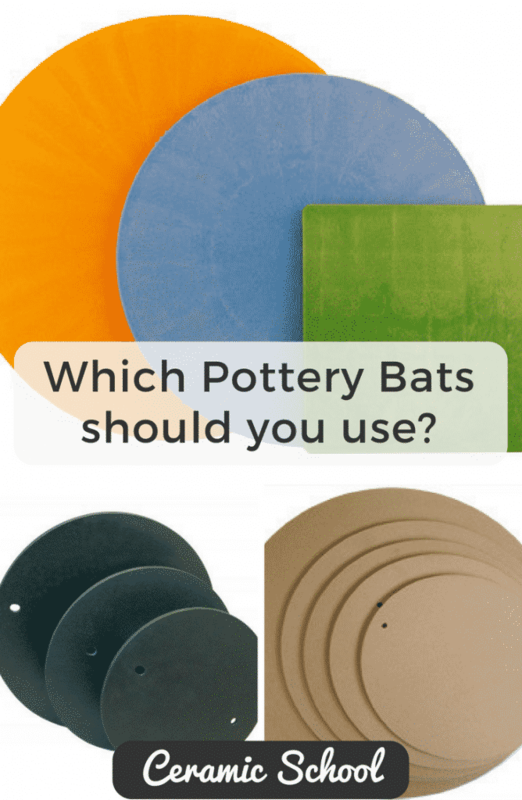 Pottery Bats – Which Pottery Bats should you use? 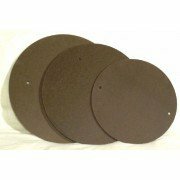 Pottery bats are removable discs, of varying size and material, that easily attach to your pottery wheel head using bat pins. Typically, pottery bats are manufactured with two holes that fit securely onto the bat pins that are on your wheel head. (Most older model wheel heads were made without bat pins, but most newer models do have bat pins) This allows you to throw your clay on the pottery bat, and not directly on the wheel head, meaning that you do not have to wire your work off the wheel head, and are therefor less likely to damage work when removing it from the pottery wheel - because you just remove the bat, and put a new one on to throw again. If you are using a Master Bat system, the process of removing a bat, and placing the next bat to work on is extremely fast. Additionally, by using a pottery bat, you can easily place a piece back to the center of your pottery wheel when you are ready to work on it some more. If you are beginning to throw: We suggest that beginners start straight away using pottery bats, because of the main advantage: No more smudgy fingerprint marks and no more disappointment & Frustration when you go and lift your pot and ruin it! Also, if you are more advanced and are throwing larger or delicate things, we also suggest that you use a pottery bat. 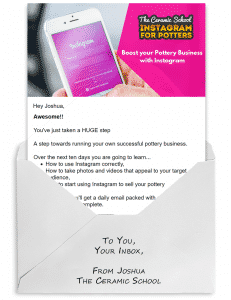 Do I have to use pottery bats? The short answer is no. It's perfectly fine to not use a bat when throwing, but, you will have to throw your clay directly on the wheel head and use wire to cut it away, then lift the pot and move it to a different location for drying. Throwing on the wheel-head can be done, but you are risking damaging your creation this way. It should also be noted that in the case of too much water being used, your pot could lose its shape upon being moved. There's nothing more frustrating than throwing a beautiful piece on your pottery wheel, only to mess it up when you are taking it off the wheel. This is why most potter's use pottery bats. Pros - The most basic material used for a pottery bat & therefore the cheapest. Wood absorbs moisture from the clay - which means that the bottom of your clay dries and is easier to get off the pottery bat. Cons - Prone to damage. The wood can warp when left too long in wet areas or just left in water. If they do get wet a lot, they can swell and then they become harder to put on and remove from the wheel head. As they are made from wood, if you use a metal tool to help pry the pottery bat off your wheel head - you might chip and damage the sides. Medex Pottery Bats are made from a sustainable, moisture resistant MDF. The material is formaldehyde-free and generated from pre-consumer recycled wood fiber. Medex pottery Bats are affordable and more durable and resistant to warping than comparable masonite pottery bats. Masonite pottery bats are less expensive and more absorptive than plastic pottery bats, making it easier to remove your piece from the bat. The absorptive quality, however, can lead to a shorter life span and care should be taken to prevent water damage by avoiding soaking or prolonged water exposure. You cannot leave any pottery bats that contain wood submerged in water, as any wood based product left in water will degrade and warp. You should also store these pottery bats on their side or diagonally to dry. The North Star Forever Throwing Bat is a wooden bat made without formaldehyde. 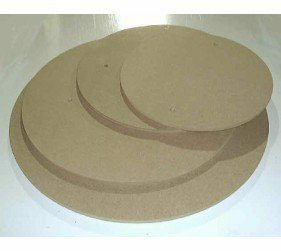 It is 1/4" in thickness and handles clay just as well as Masonite or wood. It is water resistant which prevents warping and is a durable strength. Unlike particle board or masonite, will not degrade. Two sizes are 13 & 15". Iron Star is an equally popular bat as the Forever Throwing bat. It too is a wood product with no formaldehyde and handles clay as Masonite and wood. They are 3/8" and is also water resistant, meaning no warping. Sizes available are 13, 15, 18 and 21" in diameter. North star pottery bats are standard pottery bats and come in various sizes to accommodate every potter. Pros: Sustains the right amount of water as other wood qualities and if found to be sturdier than wood and masonite. Cons: The expense is somewhat higher than Masonite. Can break and chip easily and can be burdensome in weight for some potters to handle. Plastic pottery bats are great in that they are water resistant, inexpensive to keep, and give years of use. However, with the plastic bat, even if a wire has been used to cut the pot, it still can be difficult in removing the pot. If you leave a pot on a plastic bat for too long without wiring off, there's a big chance of the dreaded S-crack appearing. 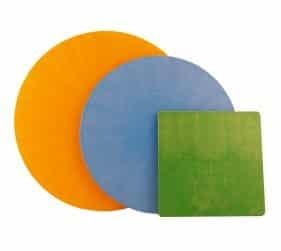 Speedball has a color line assortment of plastic pottery bats that come in square or circular shapes. Square pottery bats are handy because they take up less room in your studio while circular pottery bats are what is commonly used. The Plasti-bat made by Amaco is also a leading contender in plastic pottery bats, which also come in various sizes. Pros: Plastic pottery bats are made to last and are light in weight. The bats can be left in water for long periods of time and not warp or receive damage. Cons: Due to water not being absorbed with plastic the releasing of pots from the bat is not an easy task. Potters main complaints with plastic are that removing a clay ball can be tricky when starting a piece. Plastic pottery bats are more expensive that Masonite. Pros - No warping and has excellent water absorbing qualities, so pots dry more evenly and release easily. Pots normally self-release when they get leather hard - so no need to cut. You quite easily can make your own plaster pottery bats. Cons - Bulky and heavy. Can easily chip and break. If you like throwing on plaster pottery bats, you will more than likely enjoy the Hydro-Bat. 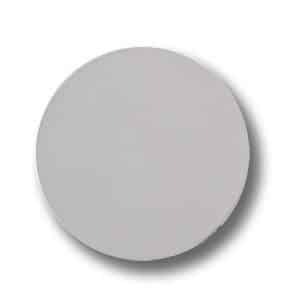 Made from Hydro-Stone and not plaster, it is at least 9 to 10 times stronger than other similar items & your pots just pop right off and dry evenly. One of the main highlights of the Hydro-Bat is that it has a scratch resistant surface & is waterproofed - allowing you to wire off without damaging your bat. Master pottery bats are a single thicker bat that you attach to the wheel head only once. This master bat has a cut out middle inlay where you can slot in child pottery bats. This means you don't have to struggle with taking the bat off the pottery wheel and putting it back on again. The Wonderbat is really well known to be one of the best master pottery bats, but we would also recommend the Dirty Girl pottery bats. These packages come with one master bat, that stays attached to your wheel head, and 10 square inserts that are 6.5" in diameter. Simply attach the master bat to your wheel-head and change out the inserts as you finish throwing your pieces. The square inserts are perfect for those concerned about shelf space. Dirty Girl's Round Bat System again comes with one master bat, but this time you get 10 round inserts that are 7.5" in diameter, so 1" larger than the square pottery bats. If you are going to use a pottery bat with your pottery wheel then be sure to do your research in order to understand the purpose of the different types available. Differences such as size, hole diameter, pin size and the wheel head will need to be considered before making your purchase. If you are unsure of what you need, stop in at your local arts and crafts store and ask for help. 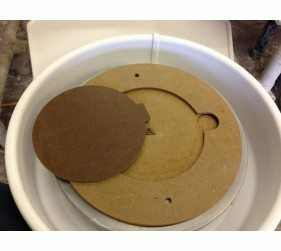 If you are thinking about buying a pottery wheel, or even buying a used pottery wheel, then check out our guides here. 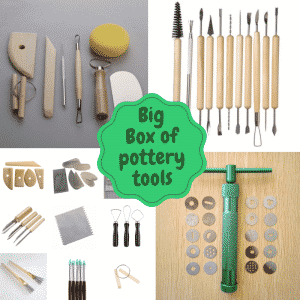 If you are a beginner, why not check out our guide on pottery wheels for beginners. It can be hard keeping your pottery bats organised over time - especially if you have several sizes and versions lying around. That's why we recommend buying a dish rack - you can easily stack your pottery bats vertically/diagonally - and even place it above your sink so that they can drip dry. Check out this 2 tier stainless steel rack on amazon.